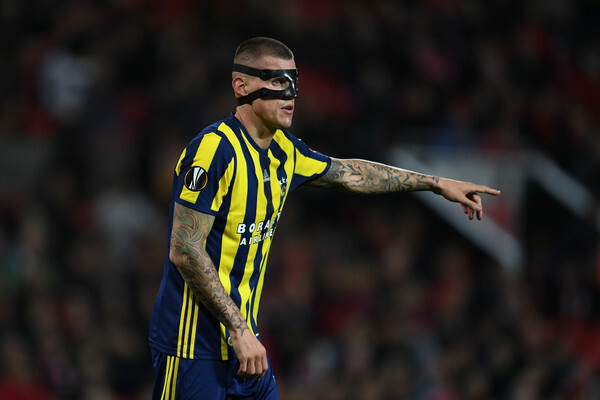 Rangers’ imminent signing of Fenerbahce stopper Martin Skrtel has hit a huge stumbling block after the 33-year old Slovakia defender increased his financial demands, according to Ibrox Noise sources. The ex-Liverpool titan appeared to agree on a deal only a number of days ago, but reportedly other clubs have now offered him significantly more, and unless Rangers are willing to up their offer (sums that would make Skrtel the best-paid player in SPL history), which they may well do, or Skrtel has a change of heart and reduces his demands back down, the deal is dead in the water. His agent has verified this today, by saying there is a financial gulf between the demands and the offer, but the problem is there wasn’t previously, and the agreement was in place to bring him to Glasgow. He is said to have rejected a huge offer from China, seemingly preferring to remain in Europe, but the *newly free agent will not come to Rangers unless agreement can be reached over the financial side of it. Hopefully it can, but without our club being held to ransom. *NB: apologies for error in this article - Skrtel is not a free agent, but contracted till 2019. Apologies again. At 33 what sort of money would he or any other 33 year old want £10k 20k or at a push 30k,greed gets the better and some times even best of friends are put on hold when it comes down to money,hey i would have thought £30k would have got him but looks like its not going be,i just hope a change of mind kicks in or piss off. Signing Skrtel as a free agent on a high salary is a no brainer, the cost will be spread over the length of his contract, the only stumbling block is if there has to never money paid up front. If not sign him and start looking for partner(s) to play beside him. Defence has been our downfall this season, just look at the last result at Easter Road. Bartley is someone I have touted for many years, I thought we should have pushed the boat out to keep him after his loan spell. Although maligned by some fans, his last game against Hibs did him no favours I thought Bates had a good future at Ibrox. We need to retain players to keep a squad, but recruit defenders, Charlie Adam would be an ideal defensive midfielder for us and look at a target man striker, as well as pacy wide player. The budget Gerrard has plus his contacts on potential loan players can fill the midfield and attack, he has to sign permanent defenders. If seems it's all about money and not about the Rangers, Mind this might not be the case!! Stevie won't pay 50k a week for a 33 year old simple as that. To be fair the agent has to get the best deal possible for the player, in the same breath Rangers have a wage structure and will table their offer around the 30k mark. End of the day it's up to Skertl take it or leave it. If not we get someone else simples!! Bartley & Goldson both keen as mustard to join the club and there will be no problem with wages on their part. We still need a leader at the back if this all goes south. Pretty sure Stevie boy will sort that out. May I also point out, this sends out a clear message to all future recruitment. Rangers will NOT be held to Ransom!!. Give him a miss , if he was on a free we could maybe push the boat out on wages but the reports are saying Fernabache want 5m euros too , so it's a big no no . We already have a 30 odd year old we’re paying a fortune “NO MORE” is he any better than alves ? I doubt it. Didn’t he also play for Fenerbahce. Will we ever learn a lesson? I doubt that also. We can’t afford to keep throwing money away like this,we need to get value for money &.protect ourselves by signing younger players we can get a transfer fee for if they have to be moved on. People say we need experience? Alves has over 90 caps for portugal, is he any good,martin had tons of experience & he was the worst defender I’ve ever seen. Don't get it. He was under contract at Ferbe. Now he's a free agent? Confusing to say the least. At 33 I don't see the value or sense in this rather spend the cash on Bartley and an other two centre backs. I agree, with our fans.......we should find some one else,who is much younger but very mature..their is a lot of centre-halves...all we have to do is,find a tall,strong and fast one...our team should,have a list.. I thought he'd like the chance to be part of something great with Stevie Gerrard. How much do these guys want?I still hope something can be done but the days of 33 year old players holding our baws to the fire need to end.The manager obviously wants him for what will arguably be the most important signing we will make. I'm honestly not mad about this it's got Senderos potential written all over it but I'll defer to the managers knowledge on this. Senderos or Skrtel or you could pick many more players around this age it comes down to who you got around you, Senderos was a great player for many years but look what happened to him here,it could be the same with Skrtel and should we pay top money for one player when we could get three or four for same money as Skrtel wants,move on now. "What's the story - Ross McCrorie" - A better song!!! Yes there are plenty younger players we could have and we have our own we want younger lads we could get three at £10k and that is less than what Skrtel wants. 33 year old being selfish. Get guy from Brighton. Burke just been released by WHU. He's 21 and would obviously have a sell on value. Would everyone be happy with that?? Skertl was a leader are any off them leaders?? honestly im not sure!! Probably not at the minute however we got Macgregor back who is a captain and dominates his box and organises his defence so I wouldn't be bothered over this. Bartley is absolutely a leader OF men. Will see how it pans out but I am delighted with what's happened so far. Wanted Skertl as a defence coach also. Hope they can sort their differences out!! I'd like to see us bring in Burke, Bartley, Goldston & John Terry to mentor them for a year or two until wee Wilson is ready. Skrtel is another Alves/Senderos waiting to happen. Burke, Bartley, Goldson, Adarabioyo and John Terry! To be fair he's on £76k/Euro 86k a week in Turkey. Would you take a third of your wage? I wouldn't. His wages are well out of our league, but we move on, plenty options out there within budget. ~IF this is true. Goodbye and Thank You. If one player thinks like that and gets HIS WAY the dressing room would be filled with unhappy teammates. Chase him back to Turkey IF it is the case.